Six research groups were awarded for their excellent papers published during the first half-year of 2017 on May 25th in the large auditorium at Ullevål sykehus. Each group received NOK 50.000 for use in further research. The prize winners gave short presentations of the main findings in their respective articles. The competition is hard. Each year around 2000 scientific papers from the hospital's researchers are published, and up to 25 of them are nominated twice a year. The six selected articles are of especially high quality, and they present important finding on both-short and long-term scales. The works reflect the good quality and the interdisciplinarity that characterises several research environments at Oslo University Hospital. The research is a fundamental condition for the institution to maintain and strenghten the quality in the patient treatment. From left: Anna Bujko, Vikas Sarna, Gry Skodje, Kristina Haugaa, Fergal O'Farrell og Olav B. Smeland. 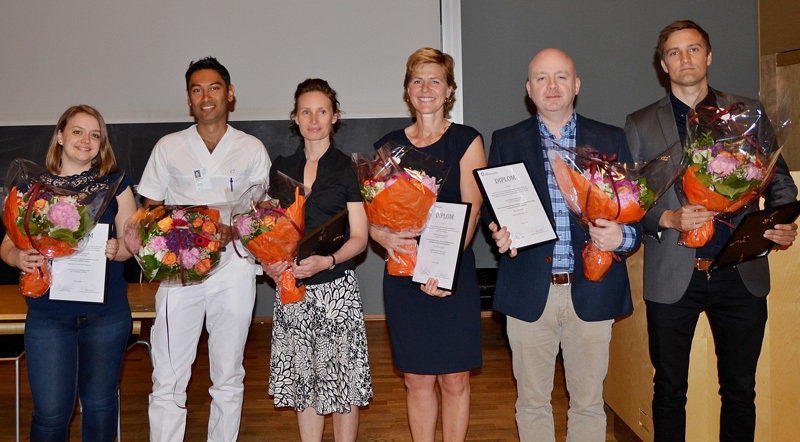 The half-yearly article award ceremony has become an important tradition that both presents a selection of the very best papers published at the hospital and at the same time acknowledges outstanding research milieus. The selected articles have been through a very thorough selection process and represent long-term work that is based on broad cooperation, both internally and internationally. The results presented in the articles are very important and will contribute to better understanding of various diseases and be of importance to future diagnosis and treatment. We are incredibly proud of the impressive quality and broad range of research at Oslo University Hospital, says Director of Research, Innovation and Education Erlend B. Smeland. Transcriptional and functional profiling defines human small intestinal macrophage subsets. Bujko A, Atlasy N, Landsverk OJB, Richter L, Yaqub S, Horneland R, Øyen O, Aandahl EM, Aabakken L, Stunnenberg HG, Bækkevold ES, Jahnsen FL. J Exp Med. 2018 Feb 5;215(2):441-458. doi: 10.1084/jem.20170057. Epub 2017 Dec 22. HLA-DQ-Gluten Tetramer Blood Test Accurately Identifies Patients With and Without Celiac Disease in Absence of Gluten Consumption. Sarna VK, Lundin KEA, Mørkrid L, Qiao SW, Sollid LM, Christophersen A.
Gastroenterology. 2018 Mar;154(4):886-896.e6. doi: 10.1053/j.gastro.2017.11.006. Epub 2017 Nov 14. Gastroenterology. 2018 Feb;154(3):529-539.e2. doi: 10.1053/j.gastro.2017.10.040. Epub 2017 Nov 2. Hasselberg NE, Haland TF, Saberniak J, Brekke PH, Berge KE, Leren TP, Edvardsen T, Haugaa KH. Nat Cell Biol. 2017 Dec;19(12):1412-1423. doi: 10.1038/ncb3631. Epub 2017 Oct 30.